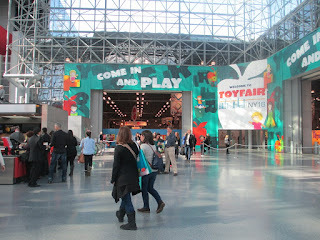 There is soooo much to see at Toy Fair NY every year that it takes me a while to get my act together and write some highlights posts. This article has my overall favorites. Check back next week for my post about dolls only. I saw so many beautiful, endearing, interesting dolls this year that they deserve a post all their own. These highlights have something for everyone so stick with it to the end. There are toys from giant companies and small start-ups, for little kids and big kids, boys and girls. Some are fairly inexpensive and a few are –let’s just say “higher priced.” The only thing they all have in common is that from a grandmother’s perspective (that’s me) I appreciated them and think a child will enjoy them also. 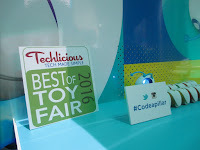 There are NO toys with apps but one is in the high tech category. Some of these toys are not on the market yet but they all will be by the next holiday season. If they are available now at Amazon, you’ll find a link at the end of the article. All of the pictures were taken by me - no stock photos. The pictures therefore are not perfect but they are real. 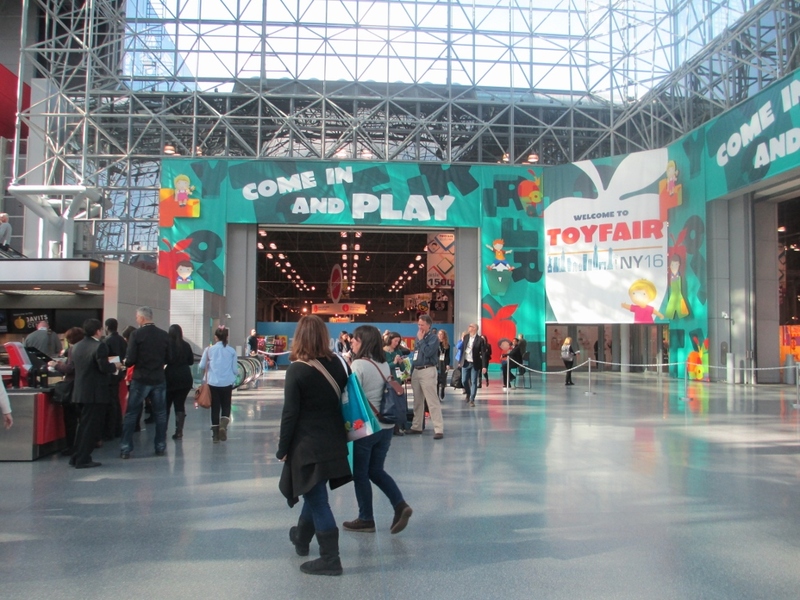 Without further delay…..Here are my favorites (except for dolls ) from Toy Fair NY 2016. This is the most interesting hi-tech toy for young children I have ever seen. Although it is definitely hi-tech, it has the look and feel of a classic caterpillar toy. It consists of 8 modules with a usb connector at each end. On top there is a light up indicator with its function – turn right, turn left, go straight, etc. 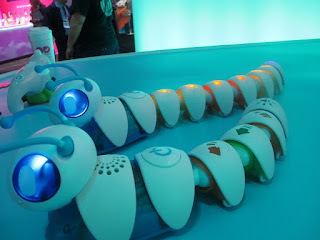 Depending how you put them together, the “Code-a-pillar will read the code you made and send the caterpillar in directions according to the code. This toy will fascinate young children, older kids and adults and have you trying to create a specific path or just see whatever which way you created. 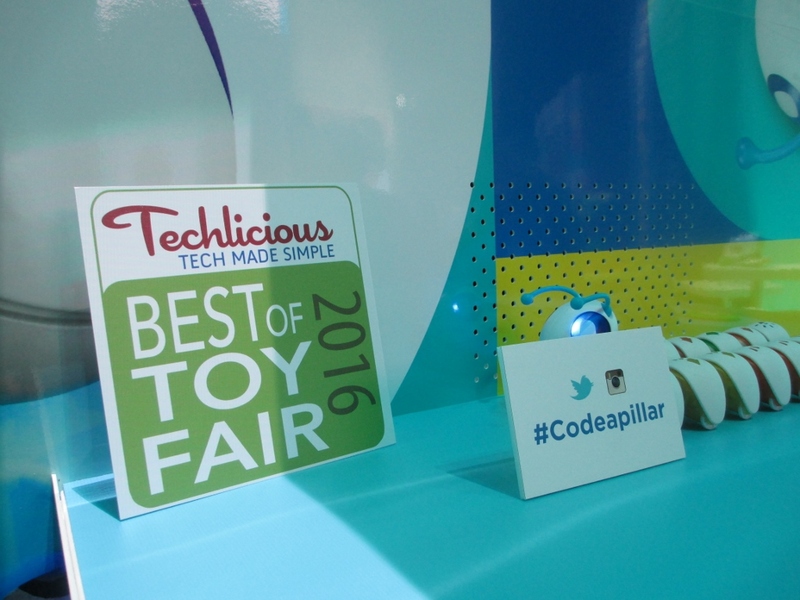 At Toy Fair, the code-a-pillar was demonstrated on a large table and it drew a large crowd that just kept watching. 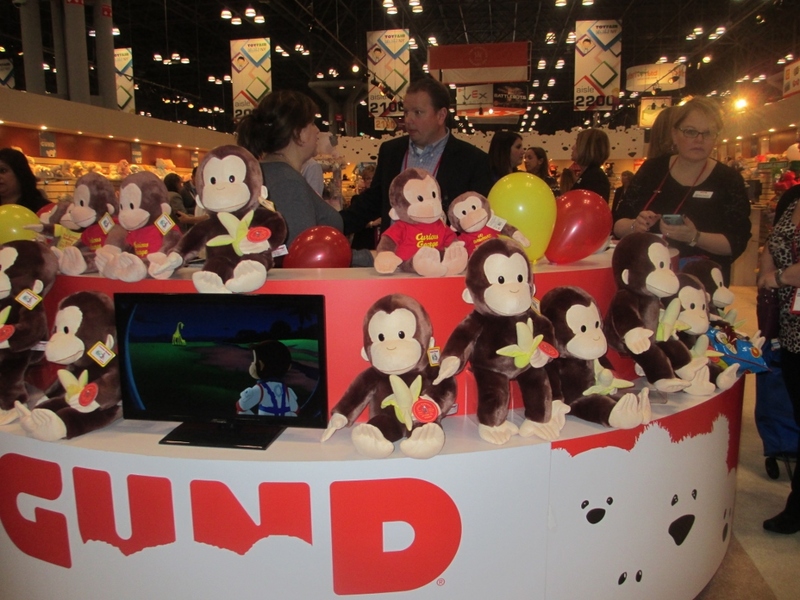 It was a Toy Fair prize winner too – a big deal among the thousands of toys considered. Priced at $50 and available in June, I predict that this will be a hot seller next holiday season. Cooking with children is becoming very popular and in case you are like me and didn’t know it, there is a hit TV series called Master Chef Junior. 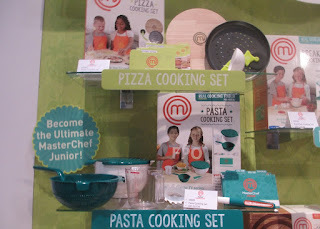 These modern cooking sets are eye catching and a good way to involve children with cooking. 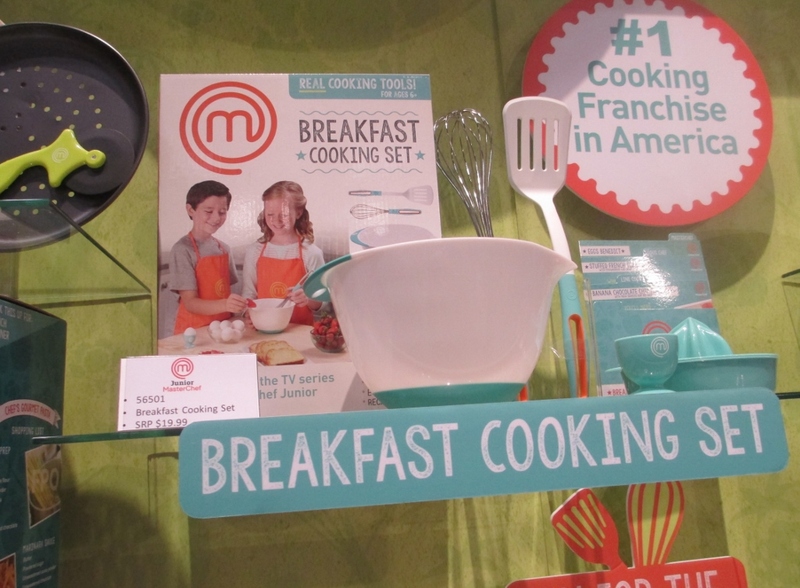 Kids will love having their own cooking tools. 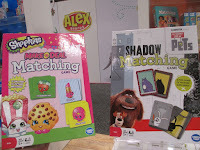 All the sets include REAL cooking tools with kid-safe, non-slip silicone grips and recipe cards with fun recipes. There are sets for baking, breakfast, pizza and coming out soon is the Pasta Cooking Set. 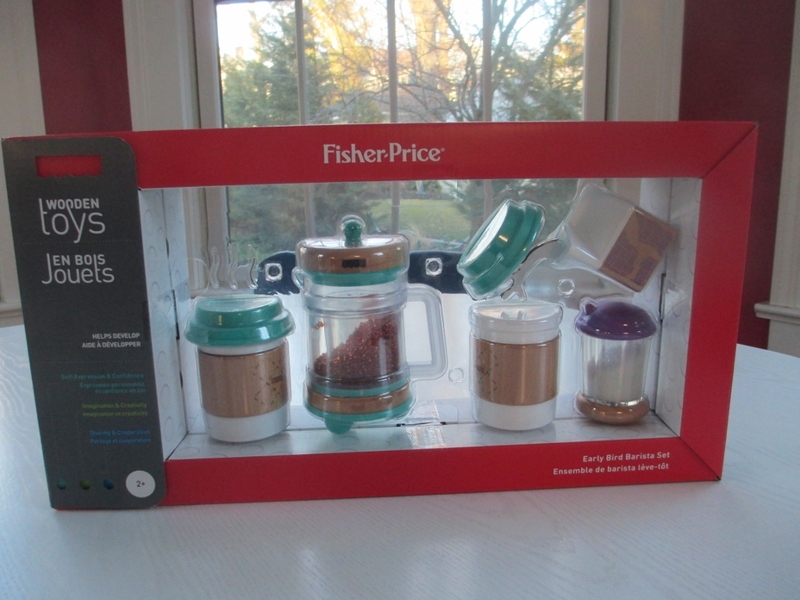 Priced under $20 this is a great gift for a grandparent to give and use with a grandchild. 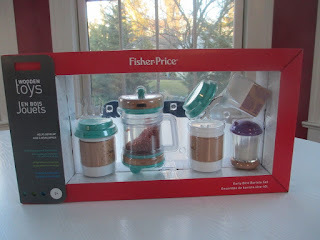 Sticking with the same theme – out with the cute little tea set and in with the Barista Set from Fisher Price. Instead of tea cups there are two take out coffee containers, sugar, creamer and coffee pot. Lets face it - this is a lot more realistic than a tea set, kids will identify with it and enjoy playing grownup the way they actually experience it. Ok - I am a sucker for cute and these are very cute. 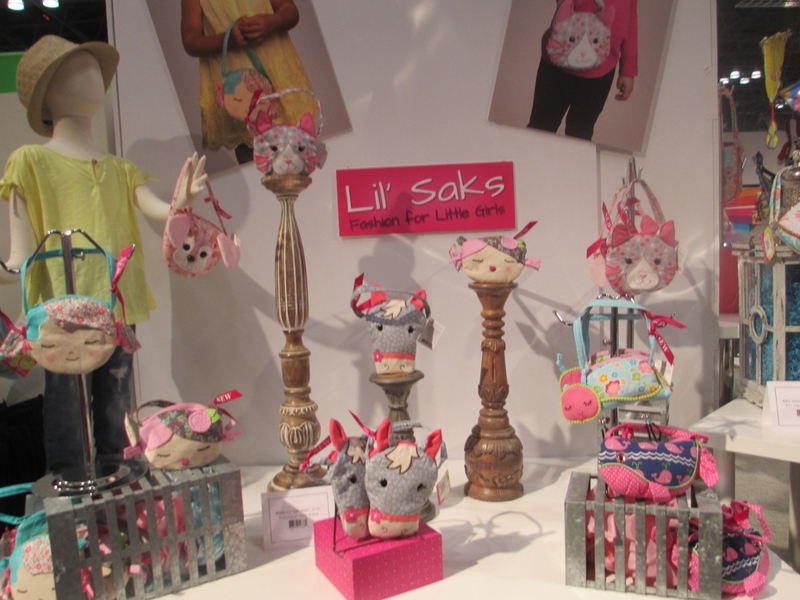 These small purses are simple yet fashionable for little girls. Every little girl loves having a purse and these cloth, washable, lightweight ones are sure to be favorites. There are eight new designs including Girl with Pig Tails (my favorite), Girl with Pony Tail, Whale, Snail, Dog, Cat, and Horse. These will be available soon and are the perfect accessory for that new Spring holiday outfit. Priced at $11.99, they will make a nice gift from Grandma. 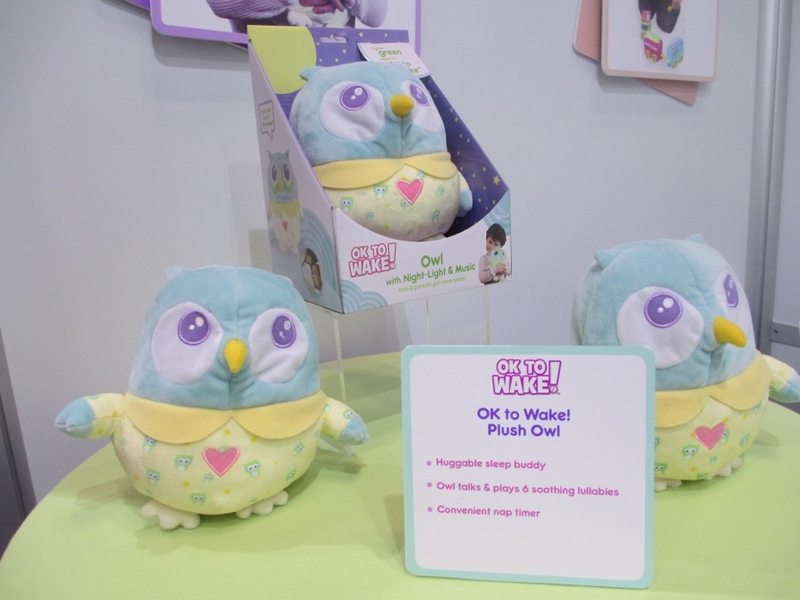 There are lots of night lights with white noise designed to help put a baby to sleep but this one has a different twist – you can set a timer that will light up in the designated time letting a toddler know that it is now OK to wake up. If this works for your child/grandchild, it will be worth its weight in gold. 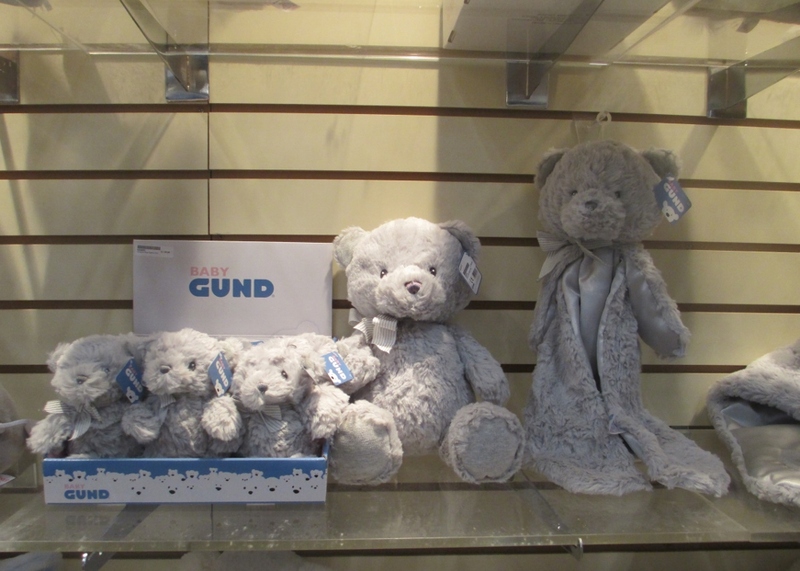 It is such a soothing experience in the middle of the hustle bustle of Toy Fair to walk through the Gund booth full of the softest, cutest plush ever. 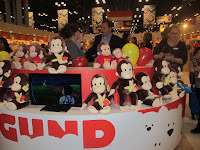 Curious George is celebrating his 75th birthday and there was a big display and party for him, but what caught my eye most was the new plush in gray. Gray is the in color in nursery themes right now. Funny, isn’t it – now that they all know the gender of the baby before birth, the parents want gender neutral themes. These beauties work in today’s nursery. Everything Shopkins is all the rage for young kids, older kids, boys and girls too. This simple game by Wonder Forge can be a good bridge for kids who don’t have much else in common. 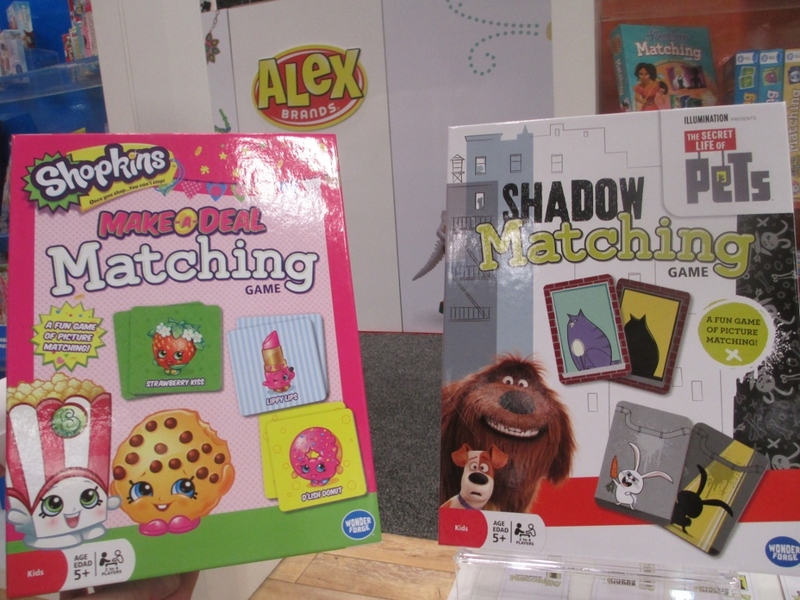 Also pictured – a similar game which uses shadow matching for older kids - The Secret Life of Pets - is another popular theme. Check out the Wonder Forge website for games with all the popular toy themes. I am always on the lookout for new toys that will be good for a grandfather/grandchild partnership project. I believe this one is no less than perfect. These are real wood marble roller coaster building sets. There are four different sets of varying size and complexity. I saw the working completed sets on display and they are quite impressive. They come with comic book instructions which also explain the physics of how the roller coaster works. 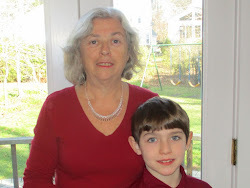 Are the grandkids visiting for a weekend or more? 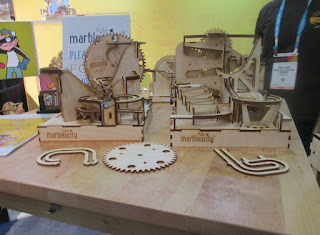 Marbleocity will provide hours of building fun for older kids. Grandfathers will love this. Younger girls will love this story telling building set. 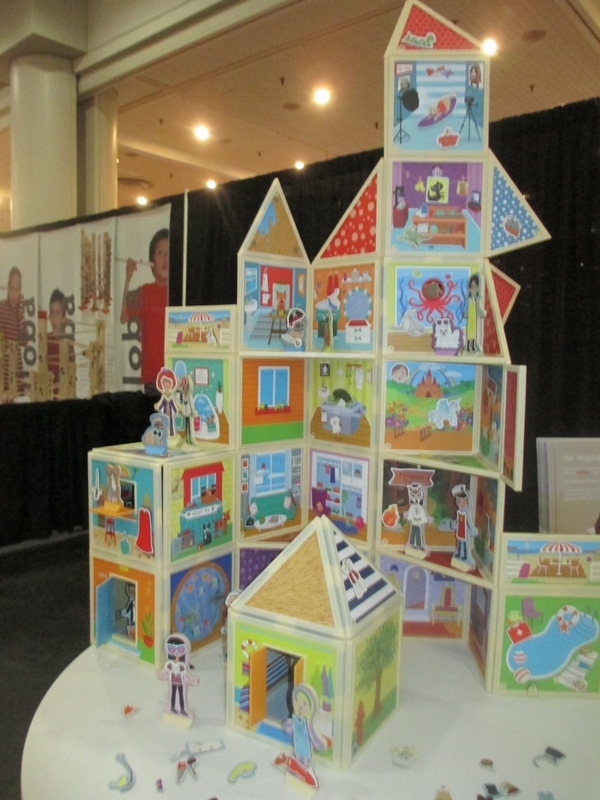 Build and Imagine building sets are made up of magnetic storyboards that can be put together in any way a child would like. There are five sets ranging in price from $35 to $60. Themes include a beach house, a marine rescue center, a pet portrait studio and more. This small company is the winner of many prestigious awards for this creative new product. I highly recommend checking this out. Great reviews on Amazon. 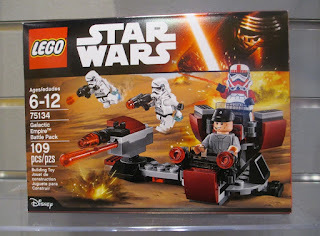 The Star Wars craze is not over and LEGO has lots of new sets to choose from. Look for that red and gold symbol on top of the box to make sure you are getting a Force Awakens themed set. I listened in to an interview with Jim Silver, the "Toy Guy" from TTPM as he was talking about what he thought would be big in 2016. On his very short list - anything Star Wars - The Force Awakens themed. This is a low priced set. Most of them cost a lot more. I have over 500 pictures that I took at Toy Fair and these were the one I chose to share with you. Which are your favorites? Is there anything special you heard about that you would like me to write about? Below are links to Amazon for the items available now. Some of these will be out later in the year. Check my Pinterest Toys 2016 Board for updates when they are available. Oh WOW!!! What an awesome post and so informative. Thank you so much. I will keep referring back to this for toy ideas. How fun. I can't wait to see the post on the dolls next week.